Small evergreens can bring lots of color and character to any size landscape. These are some of the most valued plants in the landscape because they retain their color all year. And, if you have a smaller yard, don’t worry! There are plenty of unique small evergreens that take up little room and hold onto their leaves year-round so that they can add plenty of color and personality to your landscape. We have some of the most beautiful and interesting evergreens available that thrive in our arid environment. Homeowners and landscapers alike rave about being able to form them into interesting shapes for formal gardens. Some homeowners choose to let them grow as a hedge. We can use them to hide things, create privacy hedges, or to create a stunning landscape design. For instance, topiary Junipers are popular because of their dense foliage. 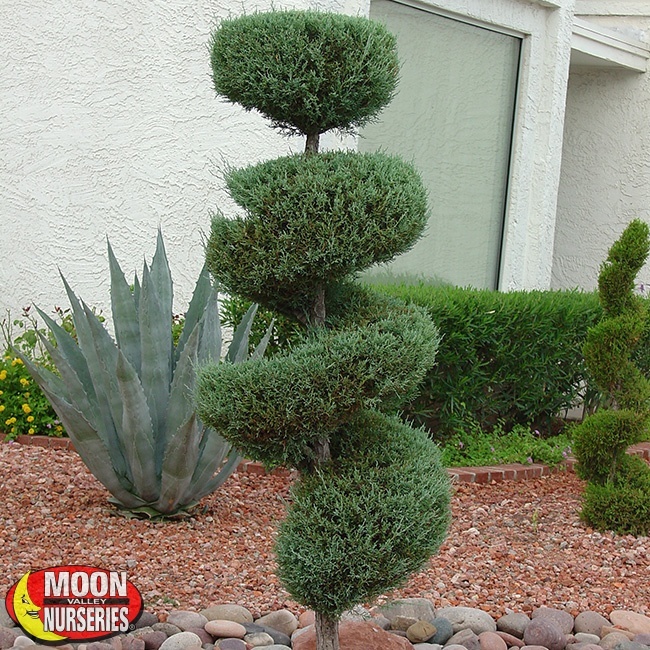 Junipers are an excellent choice for shaping into spirals, pom-poms, poodles, and more. The Wax Leaf Privet is another unique small evergreen. Wax leaf displays beautiful white blooms in the spring. They also feature glossy green foliage that is easily pruned into topiary forms. When talking about small evergreens, we need to mention our semi-dwarf citrus trees. Citrus trees provide lots of colors, emit a pleasant fragrance, and bear the sweetest and tastiest fruit! Use these plants to enhance your landscape, and you can make your outdoor living space more colorful and intimate, too. Wax Leaf Privet (Ligustrum japonicum ‘Texanum’): This evergreen is highly adaptable to topiary forms. They are a must-have in topiary gardens and look lovely in pyramid form flanking walkways and gateways. People also like to use them in neat, vertical poodle forms in elegant pots, placing them near the front door or porch steps. Springtime yields a profusion of fragrant, white flowers. The glossy evergreen foliage is its key feature, so we like to use them as a lush background foliage. We can also use them as a large-scale windbreak. Ligustrum ‘Texanum’ have a fast growth rate and a compact form that makes them one of the most versatile evergreens in a landscape. Junipers (Juniperus): Few plants can match the versatility of this evergreen. We can use them as a ground cover, privacy screen, or in vertical forms. These are very durable specimens that are built to thrive in our desert climate. We have many varieties available, in different sizes and shapes. If you are looking to add artistic flair to your landscape, consider using our Juniper topiaries. You can find them at our nurseries! They feature attractive needle-like and/or scale-like leaves that can bring plenty of year-round color to landscapes. Once established they require little water! 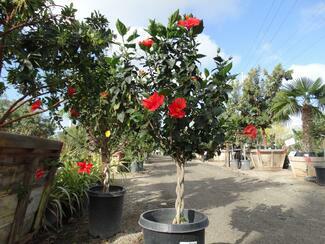 Braided Hibiscus (Hibiscus rosa-sinensis): Bring the look and feel of the tropics to your landscape! Our braided Hibiscus have had their stems trained together early in their growth, to create an appearance that is sure to attract all the right attention. These plants are a work of art! They produce the large and bold blooms that hibiscus is noted for in shades of red, orange, yellow, pink, and bicolor. They stay small so that they can fit virtually anywhere in your landscape. Their exposed trunks add an element of style. With their lush, glossy foliage and beautiful flowers, it is easy to see why these are favorites for using as an entryway focal point or to brighten up a sunny corner in your landscape. Plumeria (Plumeria var. 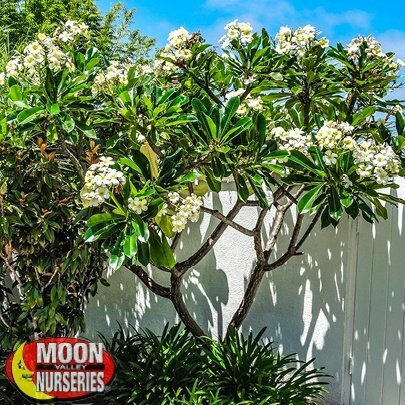 ): Plant Plumeria in your landscape and enjoy the colorful show of summertime flowers! The bloom is not just pretty, they are also fragrant, exuding scents of jasmine, citrus, spices, gardenia, and more! These are tropical trees with a gorgeous display of green leathery leaves and thick stems. They like to be planted in a sunny location in your landscape so that they can bloom properly. We can plant them nearly anywhere. There is a wide range of varieties and colors available, so visit any of our nursery locations and allow our nursery pros to help you find the perfect small tree for your landscape! Lemons: We sell the best varieties for our area, Meyer, Lisbon, and Eureka! These small trees have green foliage and bear juicy fruit ideal for cocktails and meals. Tangerines: Sweet tasting tangerines are bursting with juicy flavor! We sell the best varieties for our area including Satsumas, Clementine, Mandarin, and Sunburst. Oranges: Orange trees are a must-have in any edible garden. And at Moon Valley Nurseries, we have been growing the best varieties from only registered rootstock for over 20 years! These are magnificent landscape trees, and when the flowers bloom, you can’t help but be taken by the fragrance! Kumquats: The “little gold gem” of the citrus family, Kumquats offer numerous health benefits including anti-oxidants and essential oils. These beautiful landscape trees are shrubby and compact so that they are ideal for any size yard. Increase property value with our value-engineered evergreen trees. Moon Valley Nurseries has been custom-growing the world’s best trees for over 20 years. We have the smaller trees available that are lush, beautiful, and ready to adorn your landscape. Allow our nursery pros to help you find the perfect tree for the perfect spot in your yard.